Works lined up in studio awaiting framing. This week has been full of finishing work and preparing items needed for the Carolina Designer Craftsmen Guild show next weekend. 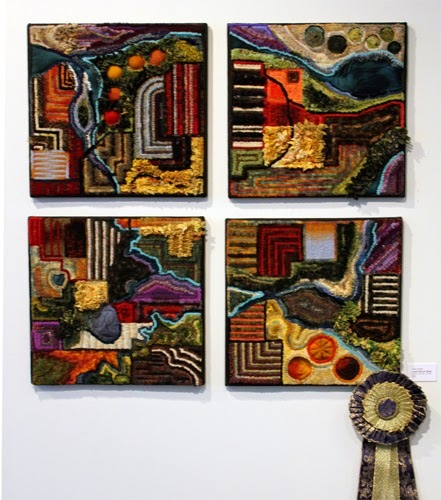 The works above have been mounted, but I often leave pieces unframed until they are going to a show, exhibit or gallery. 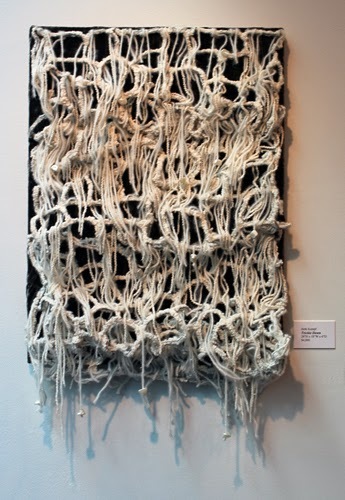 This tends to leave them available in the studio/gallery for people coming in who may want a piece left unframed. Interior designers also like to look at pieces unframed so they can choose a frame which fits the decor they are working on. 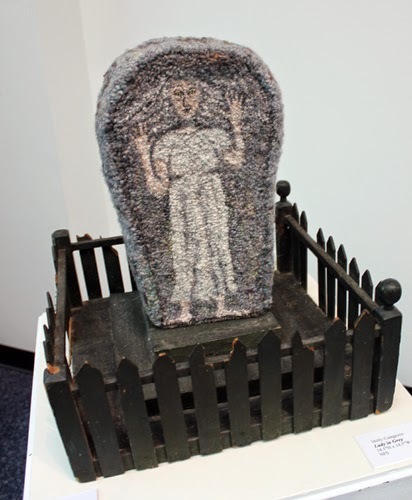 Work placed in booth display. One of my other jobs this week was to decide on the placement of work in the booth. 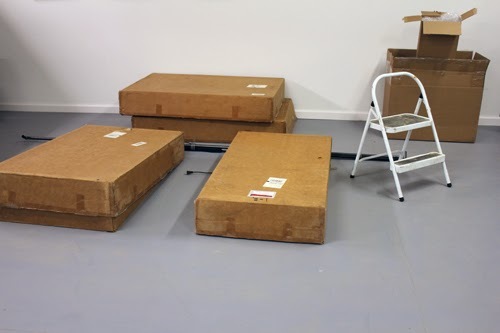 I always do this ahead so when I unpack work at the show set-up I know exactly where each piece will go. I thought the booth looked a bit spare, so I am going to include another table in the left corner that will hold some smaller 8 X 10 works. I will now have to pack all the work in boxes, dismantle the setup, pack booth parts and place everything in the show trailer for transport to the show. Since the day was spent prepping, my evenings were spent deciding on a new series of work. All the works will be 3 feet by 5 feet and I have rough designs of about six of them right now. 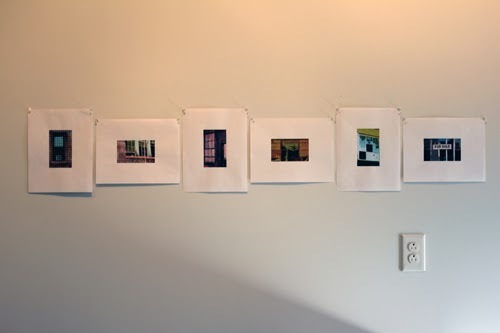 Series design ideas pinned on studio wall. The best way for me to work on a grouping is to pin up ideas on the wall. This way I am constantly glancing at them as I work on other things in the studio. I can also sit and see how they work together and where changes will need to be made. 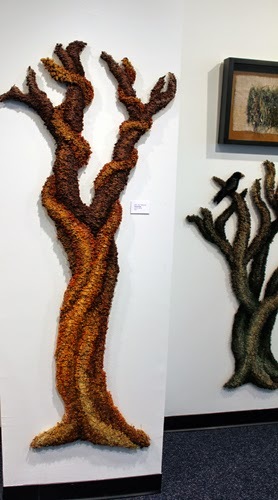 At this point I am not contemplating what type of materials will be used in the piece, only design aspects. 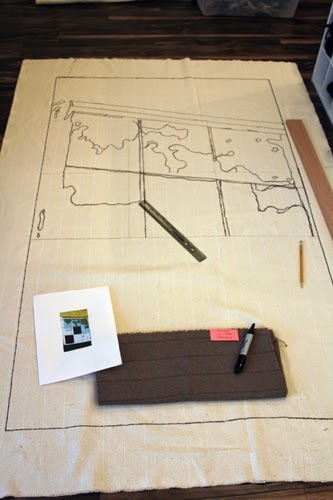 From my days in art studio classes in college, I have always worked larger designs by forming squares on backing material and drawing free hand. This works for me and brings back great memories of creating murals with my old art classmates. There may be other methods such as projectors, tracing, etc. that work for you. 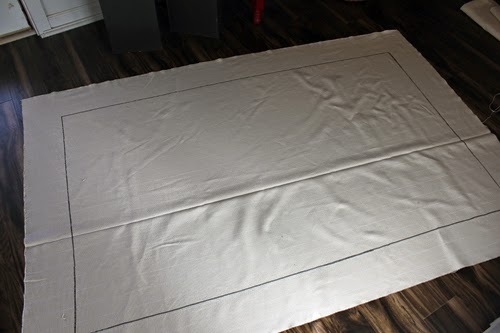 I broke up the 3 X 5 foot space on the monk's cloth into 15 squares using a ruler and pencil. The design photo was divided into the same amount of squares. I then drew what was in the square on the design photo onto the same square on the monk's cloth. I used a wall for my ideas, if a wall is not available, you can use a bulletin board. I used to use a large old piece of cardboard and place drawings and magazine cut-outs on it with push ins. The idea is to create a space larger than a notebook, a space where you can look at all your inspirations at once and have a chance to study them. There will be no post next week due to show weekend. Enjoy exploring your passions and have a great day. 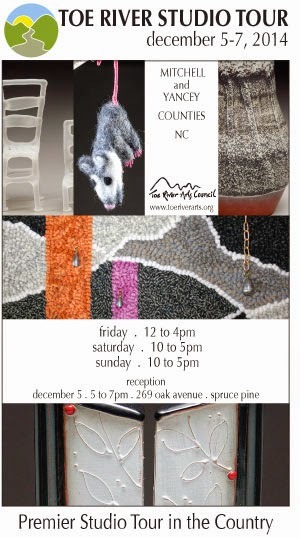 It's the time of year to dig out the boxes and determine what the booth set-up will be like for this years Carolina Designer Craftsmen show. Propanel boxes removed from storage. 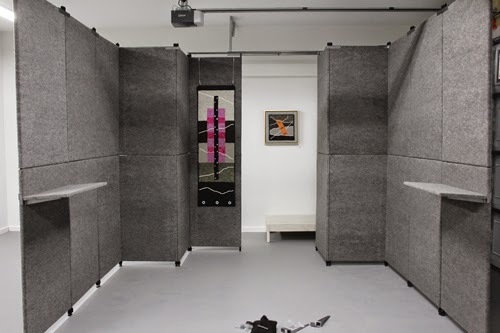 It may be just me, but I find if work needs to hang it just does not show well with the piping and curtains that are provided by show promoters. 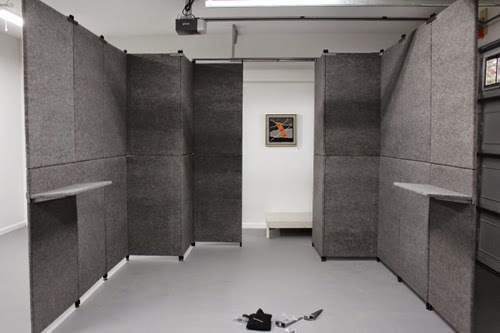 High end shows can cost anywhere from $500 - thousands of dollars for a 10 X 10 space. Your work should be shown to its best advantage. Unless you are at a show that provides preset white walls, I have found ProPanels to be the way to go. 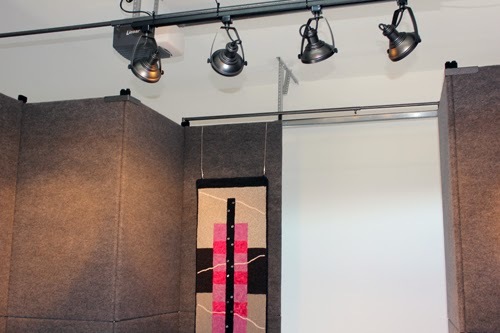 They are easy to set up, come in a variety of colors and the company offers a variety of options for add-ons such as shelving, lights, desks, etc. The lower section of ProPanels being set up. 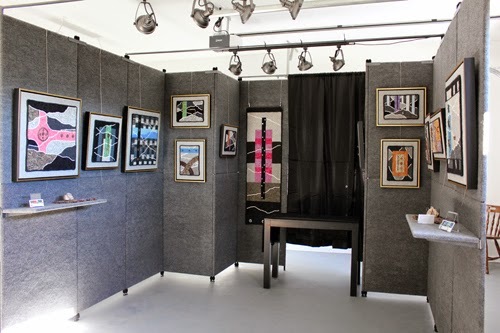 I used the gallery area to do a sample set up. I do this before each show to make sure I have all the pieces available and everything is in working order. Yes, it takes time, but it makes the set up at the show that much quicker and easier. I have been assigned a different booth space this year and will have some space behind the booth that I can use for storage. This led to working out a different design than I normally use. 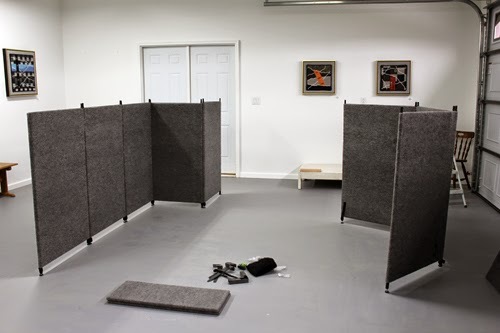 I planned the set up with the panels at the back of the booth coming out toward the center to allow for storage for boxes and packing material behind them. I also placed a shelf on either side of the entrance for business cards and artist information to be placed on. Since I have been working with gray pieces this year that will be placed on a gray background I was a little worried about how the work would show. I hung one of the pieces from a panel and found it looks really good and has a sophisticated feel to it. Lighting attached to bar above. Don't skimp on lighting. You can really never have enough. Every corner of the booth should be well lit so people can see the work well. Lowe's and Home Depot carry sets that work well or ProPanels now carries lighting. You can use track or clip on. I use track and remove the lights from the track for transport. Pack the lights carefully. I kept the original boxes and pack them fairly tight in a larger box to prevent motion during the drive. Lighting can easily be adjusted during show set-up. 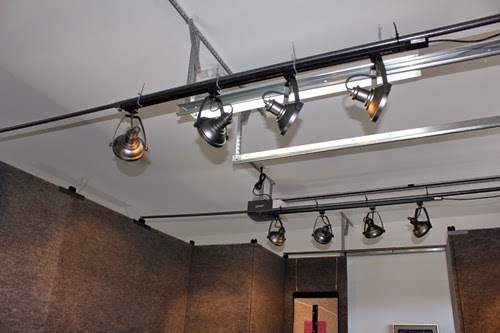 Make sure lighting is set up so it does not shine in people's eyes as they approach your booth. Rods bracing top of booth with lighting attached. I know this photo is a bit confusing as the garage door opener is above the booth lights. 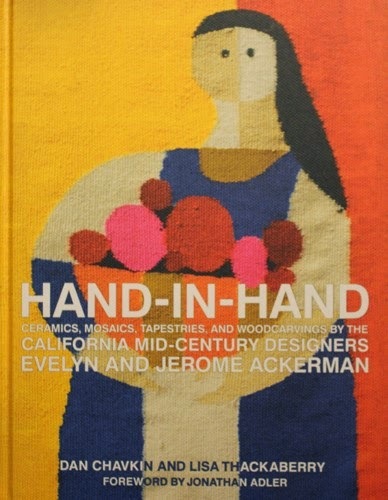 "Hand-in-Hand: Ceramics, Mosaics, Tapestries and Woodcarvings by the California Mid-Century Designers Evelyn and Jerome Ackerman written by Dan Chavkin and Lisa Thackaberry. This book was ordered a while back, after I found some of Evelyn Ackerman's work available at an auction house. It was not supposed to be shipped until December or January. It arrived this week which was perfect as I was sick with a cold and there is nothing like snuggling with a good book when not feeling well. 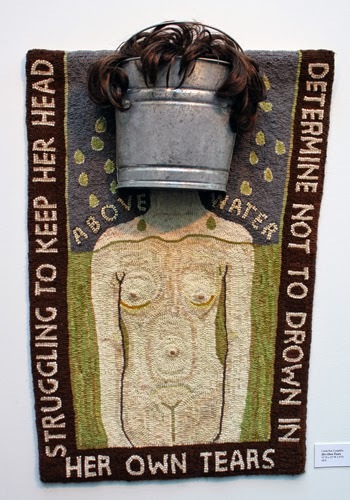 I was interested because Evelyn Ackerman experimented with rug hooking for a while. 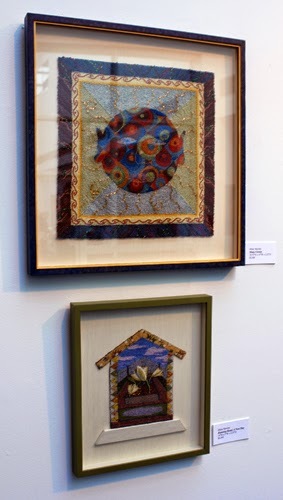 Along with photos of her wall hangings, there are photos of her colored pencil sketches and color choices. This made me think about being a bit more aware of documenting a series of work I have planned for next year. This may include filing photos, notes, sketches, thoughts as I work on each piece, why each piece was included, etc. Something to think about. 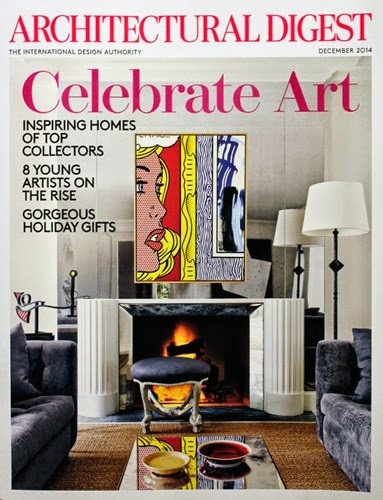 I also received my Architectural Digest this week and loved the cover text "Celebrate Art". I love viewing art in home environments and this satisfied my craving. 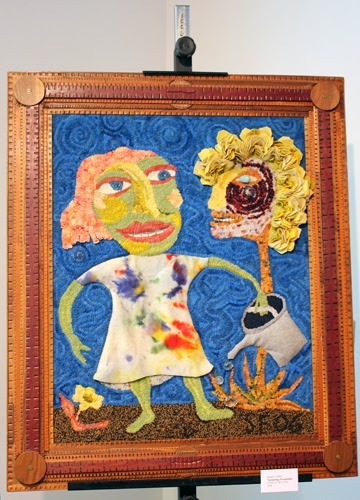 I will be teaching the class "A Creative Approach to Working in a Series" at Sauder Village in Ohio in August of 2015. Information can be found here. 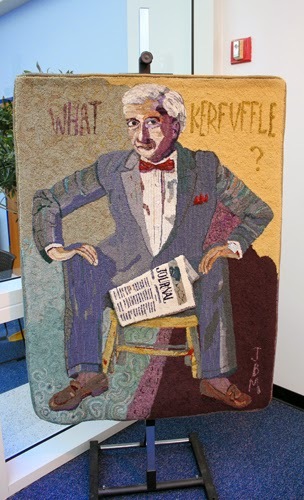 Decide how you will celebrate art this week and have a great day. It certainly feels good to be off the road and back in the studio. 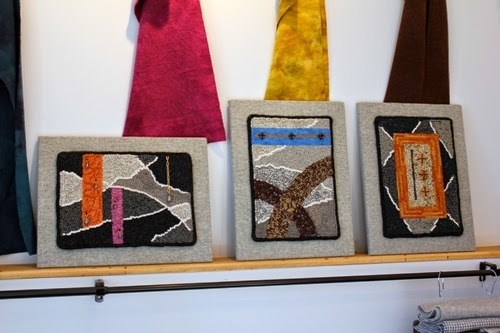 I am enjoying preparing pieces for the upcoming Carolina Designer Craftsmen Show and soon it will be time to clean up the studio for the Toe River Studio Tour. It is a busy time for the arts. 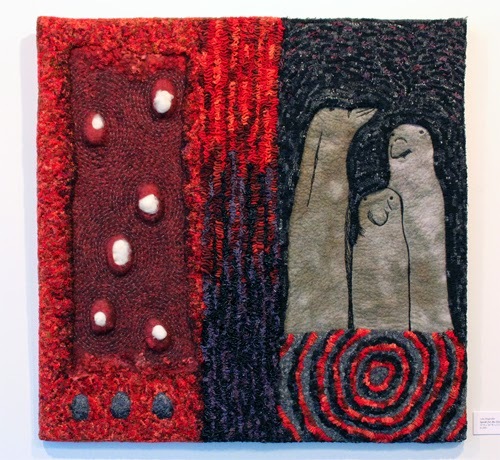 I opened an e-mail recently and was surprised and pleased to see my rug hooked work "Parallel" on the cover of this year's Studio Tour Catalog alongside four other artists' work. 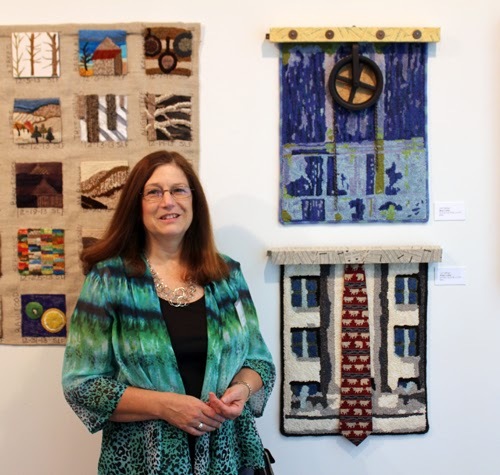 The Toe River Studio Tour happens twice a year and the holiday tour will take place from December 5-7. 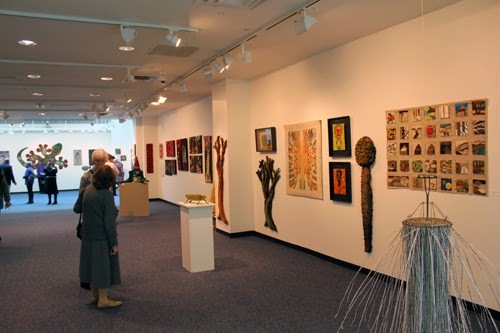 It is a great chance to see artists in their studio. If you are anything like me you enjoy seeing the materials used, how the artists studios are set up and buying art made by an artist's hand. 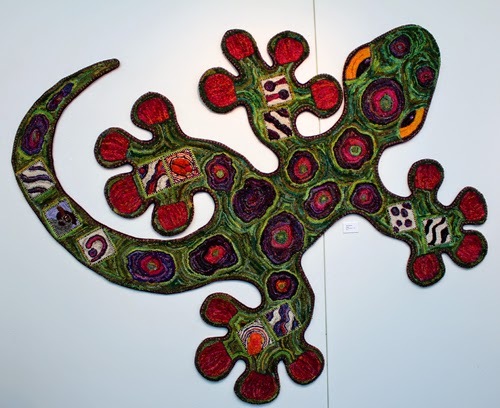 There are some talented and dedicated artists and craftsmen in our area, so if you are around please take a chance to visit. 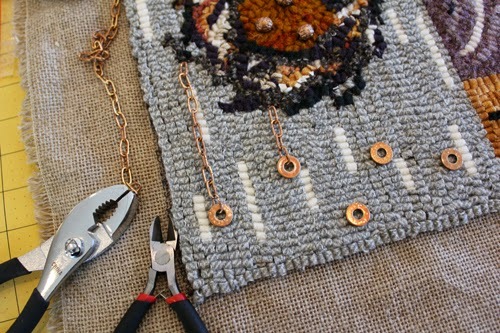 On the work table after being hooked. 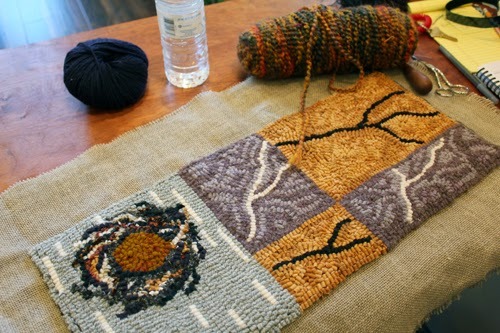 At this point, various yarns were looked at to add interest to the four rectangular areas. I decided on a rust/orange/green mixed yarn along with a plain rust to hook into the gold sections and a dark purple to hook into the lilac sections. One or two loops of color were used to resemble birds flying along migration routes. Washers and metal beads were painted. I played around with their placement until it worked visually. It is a good idea when doing this to take a photo of the decision on final placement to refer to when stitching pieces on. 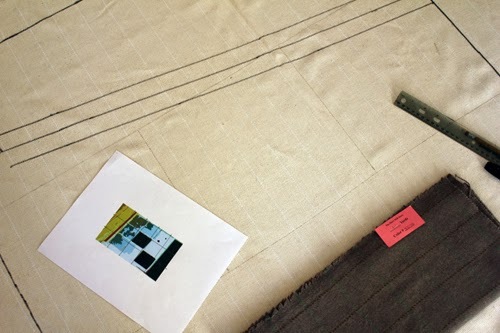 It can be easy to forget the original placement of each piece as when one piece is being stitched on the others tend to shift and fall out of place. 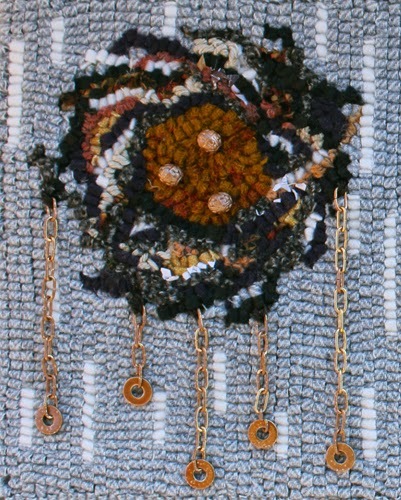 Chain was adjusted for length, attached to washers and stitched to the nest area. Regular readers may notice how this differs from the original plan of a stripe across the section below the nest. As I was hooking, I felt that the stripe might be more of a distraction, detracting from the nest area. The idea of chains lent itself to the thought of birds flying from the nest while those unhatched still remained inside the nest. 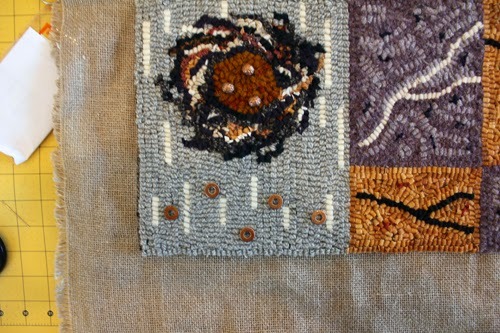 Close-up of left side of piece. 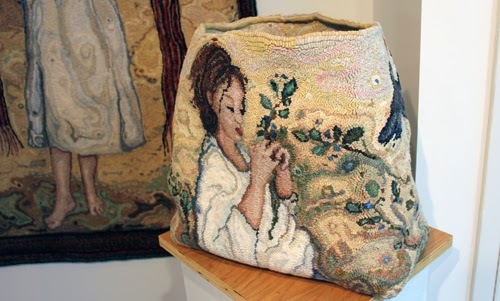 Look for studio tours or holiday art events coming up in your area and have a great day. 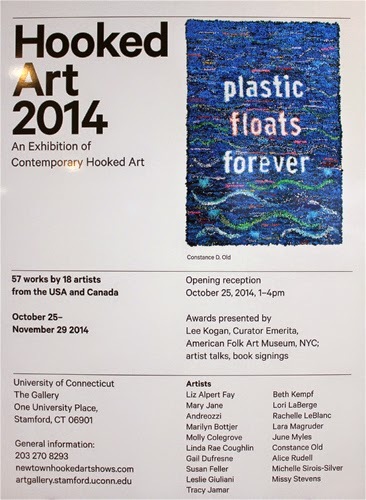 Last weekend my husband and I traveled to Stamford , CT for the opening of "Hooked Art 2014". 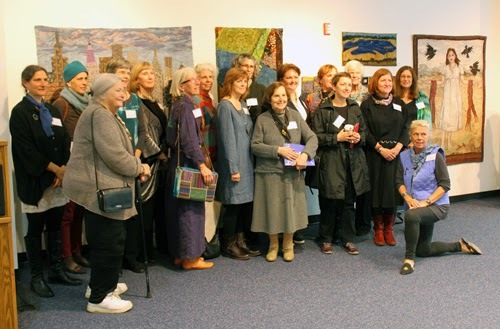 It was a great turnout and a chance for fellow artists to share thoughts on both art and the business side of our work. There is something about seeing work in person that gives you a sense of scale, texture, details and emotion that just does not happen in photos. 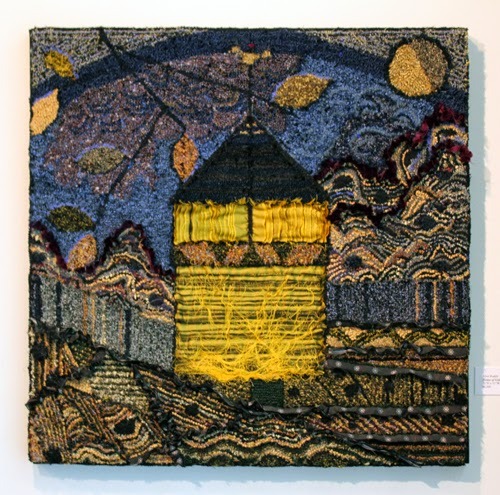 Please take the time to see this show if you get the chance, it really gives a good indication of how far the art of rug hooking has come and the direction it is moving in. 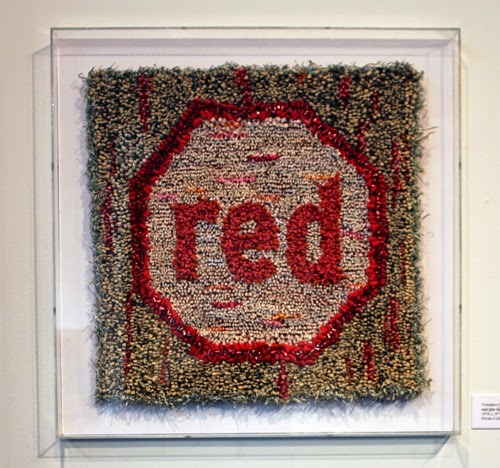 Lara McGruder, "Speak for the Dead"
Constance Old, "red (for Gail Citrin)"
Alice Rudell, "House of Gold"
Leslie Giuliani, "Man" and "Man on a Ladder"
Michelle Sirois-Silver, "Recovery Method 2"
Molly Colegrove, "Lady in Grey"
June B Myles, "What Kerfuffle? 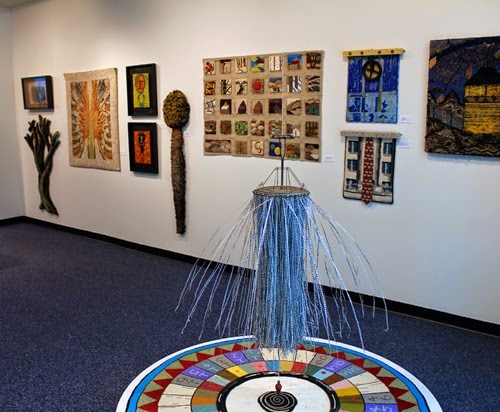 aka The Banker"
Missy Stevens, "Many Circles" and "Running Bond: A New Day"
Linda Rae Coughlin, "Her Own Tears"
Here I am with my work "Blue Collar" and "White Collar" on the right and Susan Feller's work "December 2013 Studies" on the left. 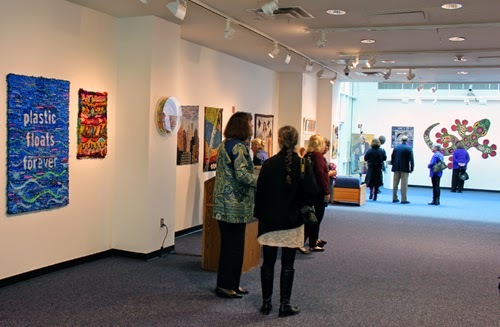 The show is at One University Drive at the Art Gallery at University of Connecticut, Stamford. It will be showing through November 29. The exhibition book is available through Blurb by clicking here. Enjoy, be inspired by others, support the arts and have a great day.